Today we're revealing two of the earliest Agents as well as giving a slight update on Kickstarter preparation. That Which Sleeps is revving up for Kickstarter, so we'd like to start introducing a couple of Agents every week in addition to continually revealing more of the game-play. Today we're going to introduce two of the earliest heroes, The Prophet and The Peddlar. The style of map is generally drab, with its dark palette perforated by stylized text that pops up to reveal key locations, while POIs display their name as you mouseover. In contrast to this paradigm we wanted the Agents to "Pop Out" from the map and be easily recognizable at the highest zoom. They generally have bright color palettes, heavy outline, and unique design - which contrasts as well with the heroes, who are themselves more drab and generic (fitting for our game's perspective). Agents move from POI to POI performing Challenges that take multiple turns to perform to create favorable circumstances for your side, from revolutions to assassinations. During the time it takes to complete an action, Heroes may hunt you down based on your Fame and Profile which results in combat. Challenges, successful or not, leave clues behind that Agents decipher which may lead to increasing the Agents fame or even deducing that an ancient evil is rising and which one in particular it is. The Prophet is one of the more unique agents, and also the only agent you begin the game with. He acts as an instructor and tutorial for new players, and is also much more powerful than other early heroes, scaling well into late game with few drawbacks unlike other powerful agents. The Prophet is an important early resource for determining the path you will take, swaying orc hordes to your side, corrupting kings, or beginning a military campaign. Bringing him out of the North early to swat down low level heroes before they grow stronger is also a massively fun, though not necessarily good, strategy. 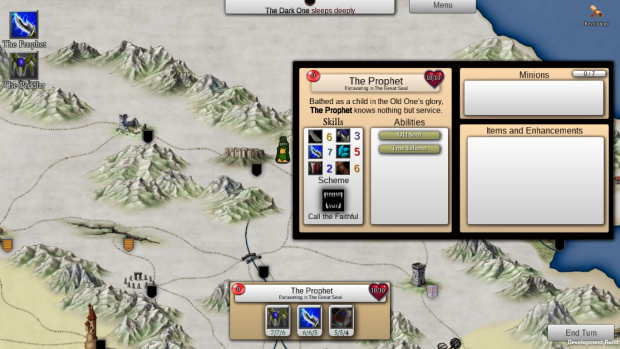 The Prophet also gains his second Ability and Scheme based on your scenario choices, which will also boost some of his skills. We will cover below his most likely setup. Scheme: Call the Faithful - Call the faithful has no empowerment requirement but works dependent on the Prophet's fame, raising the population of nearby POIs and shifting their cultures towards that of the Old One. Ability: Old Soul - The Prophet cannot be Empowered as usual but gains new abilities as the Old One grows closer to awakening. Ability: True Believer - The Prophet's conviction is paramount, he restores his Divine Defense at the start of every combat round, and gains additional Terrorize actions. 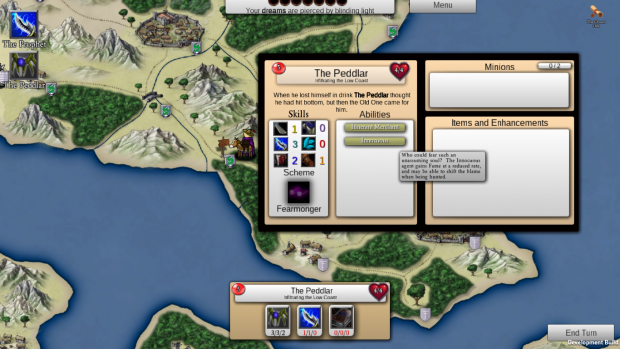 The Peddler is part of the first three fundamental agents that can be recruited by the Old One, he is skilled at infiltrating villages and deceiving heroes. Most importantly, he has an awesome Donkey that does all the hard labor for the dynamic twosome. Though weak, he is one of the only early heroes that can routinely perform challenges without worry of being eventually hunted down. The Peddler can be empowered, or his Donkey can be empowered in his place, which does not increase his profile as empowerment normally does. Scheme: Fearmonger - Unique among schemes it requires no empowerment from the Old One to perform. It allows the Peddler to choose an "intolerance" for a Village POI - make a village fear sorcerers and watch your magical pursuer be lynched. Ability: Itinerant Merchant - The Peddler is welcome everywhere, and does not pay a cultural penalty in any village - in addition he can sell cursed items to heroes who are shopping in his location. Ability: Innocuous - The Peddler could hardly be considered a threat, he gains reduced fame for his challenges and his clues are harder to decipher. Also, he can shift the blame for a challenge to another hero that is wanted by the nation or hated by the POI. Still working hard on the demo! I'll be moving next week so development may slow down, but we should have a few videos coming out soon to showcase gameplay. If you are interested in seeing us get to where we need to be, please join the mailing list below - Thanks!